Drivers and passengers should make their own arrangements. Don’t forget to make sure everything you need for walking is accessible in the car. Navigational instructions for drivers are in a printable document (see left). The obvious route for everyone will be by the M5, leaving at junction 28. Google estimates the travel time as just over 2 hours from my house. If you want a coffee break, there are several services on the M5. 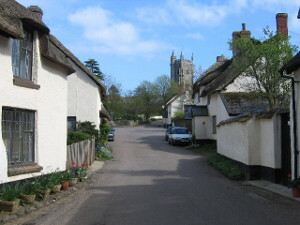 We will park in the village of Broadhembury, from which the walk starts. Note that there are no public toilets. Be ready to start walking by 1330. You should make your own arrangements for lunch. If you decide not to bring a packed lunch, you can find the Keepers Cottage Inn a few miles before you reach Broadhembury, the Drewe Arms in the village, and a small tearoom also in the village. We will start our 4½ mile walk at 1330. It is not difficult, and although there is a possible shortcut, it starts with a steep descent. A large part of the walk is on a road, which should have little traffic. Click for a map of the walk. When we return from the walk, we drive to Sidholme Hotel, where we hope to arrive by 1630. Dinner will be at 1900, followed by a quiz organised by the hotel.